This excerpt is made available for DGM 2740 students only according to "Fair Use" guidelines for educators and the "TEACH" act. You are not allowed to retain or redistribute this excerpt. I've added some emphases to key vocabulary words and statements in this excerpt. Steve Krug, Don't Make Me Think! "Michael, why are the drapes open?" "What's the most important thing I should do if I want to make sure my Web site is easy to use?" I've been telling people for years that this is my first law of usability*. And the more Web pages I look at, the more convinced I become. *Actually, there is a close contender: "Get rid of half the words on each page, then get rid of half of what's left." But that one gets its own chapter later. It's the overriding principle-the ultimate tie breaker when deciding whether something works or doesn't in a Web design. If you have room in your head for only one usability rule, make this the one. I should be able to "get it"-what it is and how to use it-without expending any effort thinking about it. Just how self-evident are we talking about? 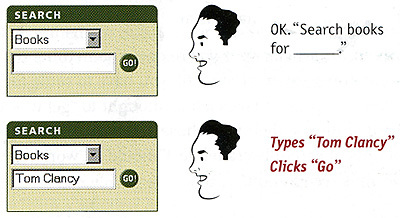 When I'm looking at a page that doesn't make me think, all the thought balloons over my head say things like "OK, there's the ___. And that's a ___. And there's the thing that I want." But when I'm looking at a page that makes me think, all the thought balloons over my head have question marks in them. When you're creating a site, your job is to get rid of the question marks. 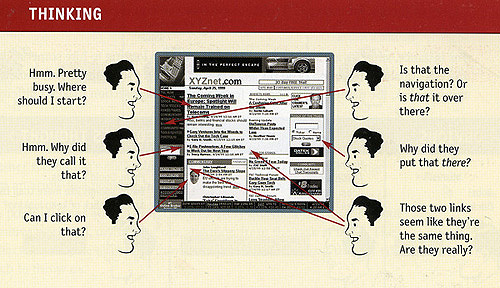 All kinds of things on a Web page can make us stop and think unnecessarily. Take names of things, for example. Typical culprits are cute or clever names, marketing-induced names, company-specific names, and unfamiliar technical names. For instance, suppose a friend tells me that XYZ Corp is looking to hire someone with my exact qualifications, so I head off to their Web site. As I scan the page for something to click, the name they've chosen for their job listings section makes a difference. Note that these things are always on a continuum somewhere between "Obvious to everybody" and "Truly obscure," and there are always trade-offs involved. For instance, "Jobs" may sound too undignified for XYZ Corp, or they may be locked into "Job-o-Rama" because of some complicated internal politics, or because that's what it's always been called in their company newsletter. My main point is that the tradeoffs should usually be skewed further in the direction of "Obvious" than we care to think. Another needless source of question marks over people's heads is links and buttons that aren't obviously clickable. As a user, I should never have to devote a millisecond of thought to whether things are clickable-or not. 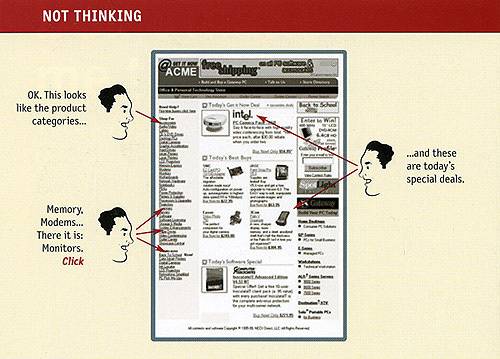 You may be thinking, "Well, it doesn't take much effort to figure out whether something's clickable. If you point the cursor at it, it'll change from an arrow to a pointing hand. What's the big deal?" The point is, when we're using the Web every question mark adds to our cognitive workload, distracting our attention from the task at hand. The distractions may be slight but they add up, and sometimes it doesn't take much to throw us. And as a rule, people don't like to puzzle over how to do things. The fact that the people who built the site didn't care enough to make things obvious-and easy-can erode our confidence in the site and its publishers. 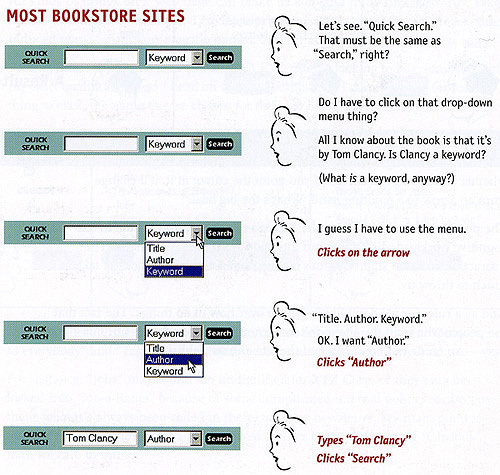 Another example: On most bookstore sites, before I search for a book I first have to think about how I want to search. Granted, most of this "mental chatter" takes place in a fraction of a second, but you can see that it's a pretty noisy process. Even something as apparently innocent as jazzing up a well-known name (from "Search" to "Quick Search") can generate another question mark. Amazon.com, on the other hand, doesn't even mention the Author-Title-Keyword distinction. They just look at what you type and do whatever makes the most sense. But the last thing you need is another checklist to add to your stack of Web design checklists. The most important thing you can do is to just understand the basic principle of eliminating question marks. If you do, you'll begin to notice all the things that make you think while you're using the Web, and eventually you'll learn to recognize and avoid them in the pages you're building. Your goal should be for each page to be self-evident, so that just by looking at it the average user* will know what it is and how to use it. *The actual Average User is kept in a hermetically sealed vault at the International Bureau of Standards in Geneva. We'll get around to talking about the best way to think about the "average user" eventually. Sometimes, though, particularly if you're doing something original or groundbreaking or something very complicated, you have to settle for self-explanatory. On a self-explanatory page, it takes a little thought to "get it"-but only a little. The appearance of things, their well-chosen names, the layout of the page, and the small amounts of carefully crafted text should all work together to create near-instantaneous recognition. If you can't make a page self-evident, you at least need to make it self-explanatory. The fact is, your site may not have been that easy to find in the first place and visitors may not know of an alternative. The prospect of starting over isn't always that attractive. And there's also the "I've waited ten minutes for this bus already, so I may as well hang in a little longer" phenomenon. Besides, who's to say that the competition will be any less frustrating? Making pages self-evident is like having good lighting in a store: it just makes everything seem better. Using a site that doesn't make us think about unimportant things feels effortless, whereas puzzling over things that don't matter to us tends to sap our energy and enthusiasm-and time. But ... the main reason why it's important not to make me think is that most people are going to spend far less time looking at the pages we design than we'd like to think.